ICC: Kenyatta's win changes nothing Jump to media player Despite his victory in the elections, Uhuru Kenyatta is due to stand trial for crimes against humanity at The International Criminal Court in the Hague. Kenyatta: 'Triumph of democracy' Jump to media player Presidential poll winner Uhuru Kenyatta has hailed Kenya's elections as a "triumph of democracy". 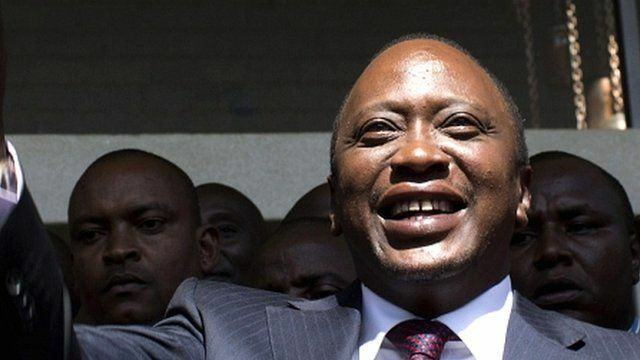 Kenyatta declared poll winner Jump to media player Kenya's Deputy Prime Minister Uhuru Kenyatta has won the county's presidential election by the tightest of margins, it has been announced. Kenya's vote causes economic 'anxiety' Jump to media player The current political uncertainty in Kenya has started to have an impact on people's daily lives and the country's economy. Despite his victory in the elections, Uhuru Kenyatta is due to stand trial for crimes against humanity at The International Criminal Court in the Hague. He is accused of organising and orchestrating the violence in which more than a thousand Kenyans were killed, charges he denies, and some say he could become an international pariah. Anna Holligan reports from The Hague.